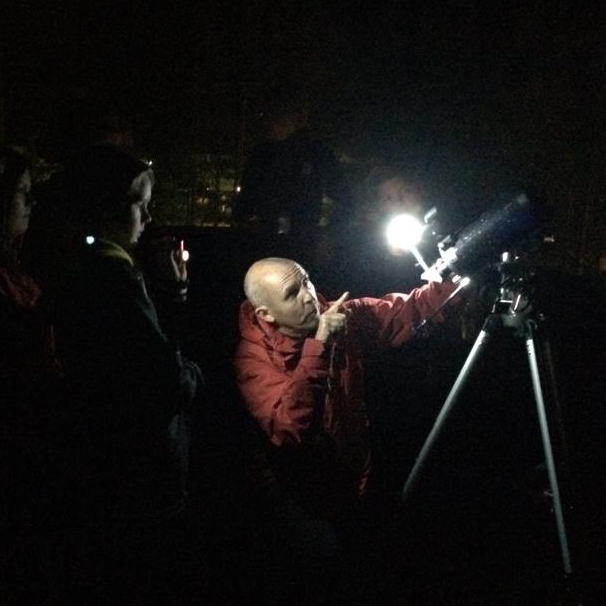 When you look at the sky on a dark night without moonlight or lights from our cities, you don’t have to wait long before you see a glimmering spot gently moving across the sky. That’s most likely to be a satellite in Low Earth Orbit. The Low Earth Orbit, LEO, is between 160 and 2000 km above the surface of the Earth. Here you find the Hubble telescope at a height of 550 km and the International Space Station some 400 km above the ground. You also find a lot of other satellites in LEO, such as earth observation satellites and weather satellites. Also in LEO we have a lot of space debris. Here you find, for instance, dead satellites, pieces of satellites and one glove. Speaking of Earth observation – To monitor our planet in a way to make the data collected today useful in the future it’s crucial to take pictures in a way that makes future comparisons possible. In sun-synchronous LEO orbits, the satellite’s track along the Earth is always at the same local time. Looking at two pictures over the same area separated in time but with both pictures taken the same local time it’s easier to spot the differences than if one picture was taken in the morning and the other one in the afternoon. 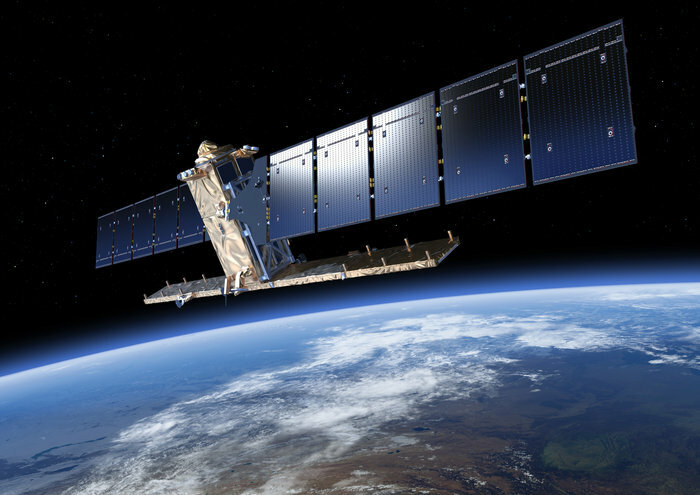 ESA’s Sentinel-1 satellites (A and B) are in a polar Sun-synchronous orbit at an altitude of 693 km. On April 25th, 2015 a devastating earthquake struck Nepal. Sentinel-1A imagery acquired before and after the quake was combined in a “false coloured picture” that made changes on the ground visible. Suddenly it was possible for scientists to quantify the ground movement by looking at a rainbow-coloured interferogram. High above the satellites in LEO you find our navigation satellites, in MEO. 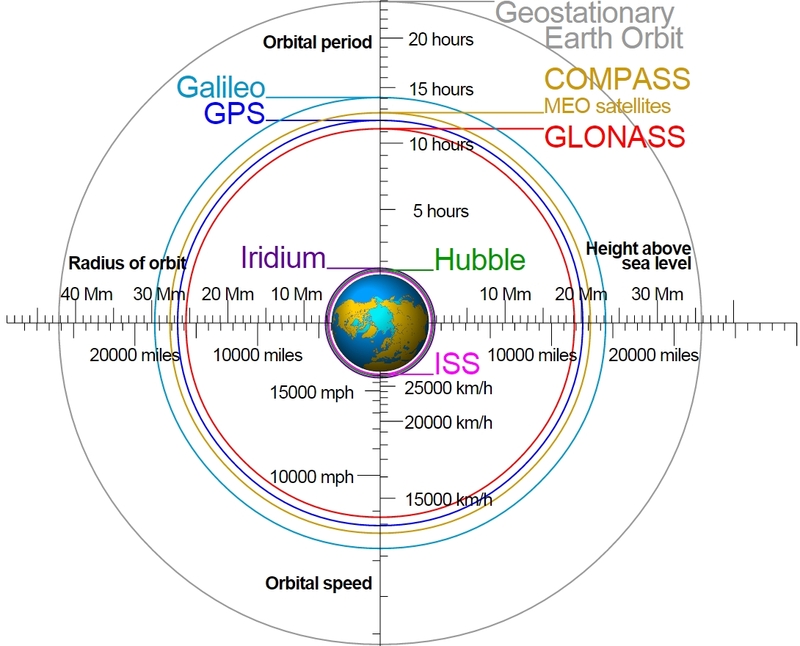 Looking at the illustration below, you find that the GPS satellites are placed in an orbit with an altitude of 20000km. You also find that it takes these satellites twelve hours to complete an orbit. In other words – GPS satellites circles the Earth twice a day. That is to be compared with the International Space station wich completes about 16 orbits a day. In GEO, Geostationary Earth Orbit, the orbital period is close to 24 hours – exactly a stellar (sidereal) day. Here you find both communication satellites and weather satellites. An Earth observation satellite in GEO “sees” the same part of the Earth during its whole lifetime, unless it’s not moved. On the other hand, you can direct a parabolic antenna at a certain communication satellite and have it done once and for all. NASA’s SDO, Solar Dynamic Observatory, is also placed in GEO. The benefit from placing it in geostationary orbit is that it requires just one antenna to more or less constantly download data from the satellite. This equation gives us the orbital speed an object need to have to keep its distance to the surface of the Earth. “G” is the gravitational constant, 6,67·10−11N·m²/kg², “m” is the mass of the Earth which is 5,97·1024kg, “r” is the radius of the satellite’s orbit. If the satellite orbits the Earth, its orbit is the radius of the Earth, 6,37·106m plus the distance between the Earth’s surface and the satellite’s orbit. We can also start from the same equation to calculate the orbital period, T. We assume the shape of the orbit is a circle. We know the radius and can calculate the circumference, 2πr. The speed is distance/time, or in this case: The orbital speed is 2πr/T as the distance is one lap and the time is T.
Almost there! Still “4π²” can be taken out of the square root. This equation gives us the period of a satellite without knowing the orbital speed of the satellite. Using the same orbit as we used earlier, 400km from the Earth’s surface, we’ll get a period of 5542s, just over 90 minutes. So, the space station does one lap around the Earth every one and a half hour which means the astronauts can see 16 sunsets every “day”. We can now, after some algebra, calculate the radius of a geostationary orbit. We know the period, T, is to be the same time as it takes the Earth to spin one time around its axis. That’s not quite the same as solar day. Let’s use the sidereal day that is approximately 86164 seconds. Now read this: ‘SpaceDataHighway’ – Why and How?